D.R. DIMES is one of the great remaining American Furniture makers with a complete selection of tiger maple furniture, oak furniture and cherry furniture. From reproduction American windsor chairs to three collections of colonial furniture, D.R. 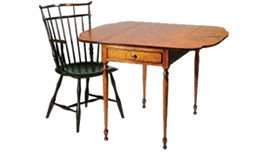 DIMES offers the widest selection of early American reproduction furniture available. All our reproduction furniture is made in our New Hampshire workshop. Watch the video »In March 2014, D.R.DIMES was selected by the Edward M. Kennedy Institute for the Study of the U.S. Senate to reproduce most of the furniture in the U.S. Senate. We delivered the entire collection in September 2014. "Yes, we're in the furniture business, but manifestly, we're in the history business." ~Douglas P. Dimes.